This week’s vlog is here to nourish the exercise part of your soul, by reviewing a technique I’ve probably shared with you a long time ago (it’s really hard to keep track of all the vlogs I’ve done! ), but it’s one that certainly bears repeating. By reducing your base of support when you’re doing an exercise, for example, you can increase the activation of the neuromuscular system and it excites the speed of reflexes. Some experts claim you can’t speed up reflexes, but I’ve found that this very much depends on the subject you’re testing and the kind of environment you’re testing in. Having trained countless numbers of elite athletes, however, I’ve found that doing these types of exercises definitely have a transfer to better posture, improved response times and finer motor control in general, in sports environments and even work environments for professionals like firefighters who climb ladders a lot or nurses who work with hard-to-manage people. 1. Don’t let your head drop down. 2. Don’t let your hips sway forward. For this vlog, I’m performing a very standard exercise, a curl to press, to demonstrate this technique. Stand on one leg and put a little softness in the supporting knee. You can use the other foot like a kickstand to catch yourself if you need to while performing the exercise. I start by inhaling and activating my core by drawing the belly button toward the spine. Then I curl, press and lower the weights. You can switch legs with every rep, or complete a set on one leg and change to the other for the next set. 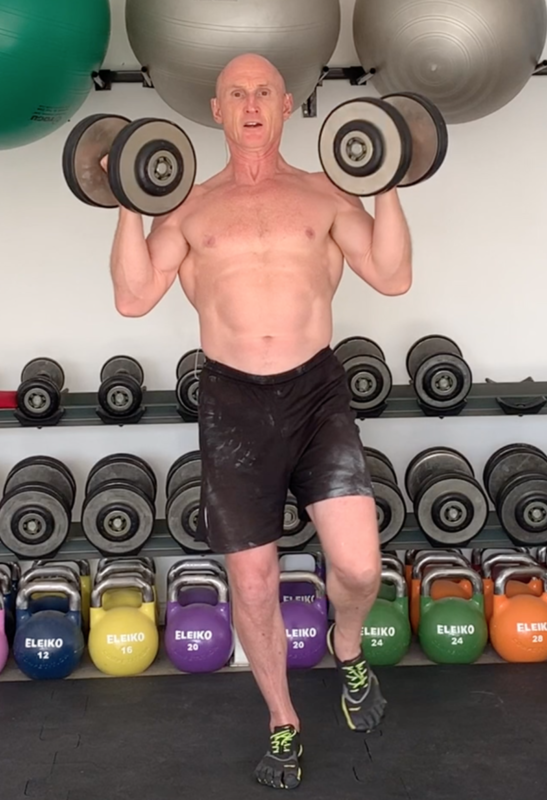 If you perform a single-arm action, generally, you’ll find it’s easier to stabilize if you’re standing on the opposite leg of the side that the weight’s on. When you have the weight on the same side as the leg you are standing on, be prepared for the weight to pull you off balance more than it did when you were standing on the opposite leg. By the same token, especially when the weight is going up above the horizontal line and you’re on the same side, it will pull you that way. Remember, as a load moves, it changes where your relative center of gravity sits. For example, if my center of gravity is in front of my sacrum (the middle of my body), as I bring a weight up, my center of gravity moves up and over slightly. Depending on how you manipulate your weights (and how heavy they are), you could move your entire center of gravity out of your body. That’s probably hard for you to visualize even in my vlog, but there are books out there about biomechanics that can explain it in more detail if you’re really interested. Then, when you switch to the other side, you’ll definitely notice how it stimulates quite a lot of activity in your nervous system. Your body will probably start shaking after a little bit, but as long as you can keep good form, you’re doing a good job. The cool thing about this technique: You can do it with pretty much any kind of exercise where you can hold onto a weight and do it while on one leg, such as a cable pull, press or woodchop. If you choose to add this technique to your workout, I recommend that you do it at the beginning. In the beginning (for a couple of weeks or even a month), use this technique as a warmup with light weights just to activate the nervous system and get the motor pathways developed so your brain knows what you’re doing, then do your workout, but don’t fatigue yourself too much. However, when you’re ready to incorporate it in your training and you want to push yourself this way, start with this technique right after your warm-up. Remember, in the CHEK system of exercise science and how I teach people to design programs, it’s always very important to start a workout with the most neurologically demanding exercise and progress to the least neurologically demanding one. Why? If you do the least neurologically demanding exercises first, they still draw a lot of energy out of your system. So, when you get to a complex exercise like this one, you may not have enough left neurologically. Most people don’t realize this, but research shows that the nervous system takes about five to six times longer than the muscular system to recover, particularly from intense exercise. The tipping point turns out to be about 8RM. If you don’t get enough rest and you’ve got to do your next set, it’s not like your muscles feel tired, but you just go to lift that bar, and it won’t move no matter how hard you try. And, if you’re doing bodybuilding type stuff, you’re probably getting “sailor fatigue,” meaning it gets progressively harder to lift or even move the weight at all. As the intensity goes up, your rest periods will have to get longer or the quality of your movement goes down and your risk of injury increases. If you’re interested in learning a lot more about this, I go into greater detail in my two program design courses. The first one, the second edition of Program Design, shows you how to design reps, sets, loads, tempo and rest periods. It’s a basic recipe of ingredients for designing an exercise program. My Advanced Program Design course gets much more complex. It shows you how to complete a needs analysis, choose exercises and carefully organize them, and design exercise programs for all kinds of people, from hard working professionals to elite athletes. And you write programs in the for the test too! Once you’ve taken those Program Design courses and want to learn a whole lot more, the next step is CHEK Exercise Coach where you’ll learn how to use exercise so you can work with clients in deeper, more scientific, holistic, therapeutic and corrective ways. I hope you enjoy this brief look at a simple but very powerful technique you can use to improve your workouts in the gym.